Posted by ayaat in Prophecy, sciences. The Arabian peninsula’s pivotal location, could become the “stepping stone” to allow the monsoon moisture to move westward each summer, if the perennial native grasses and savanna shade-trees were replanted. Left: Shows the line where the western movement of the monsoon moisture is blocked, May to September each year. Right: Producing cooler soil temperatures in summer with revegetation of the bare soils, could help the monsoon moisture to rain over the Arabian peninsula, as it did regularly 2,000-6,000 years ago. SALALAH, OMAN as the example. The cool-soil conditions created by perennial vegetation, that produce rainfall from the summer monsoonal moisture, still occurs in the mountains north of the city of Salalah Oman. HOT BARE SOILS of the Arabian peninsula has such a strong effect to block moisture, that the category-5 tropical cyclone Gonu couldn’t make landfall in June, 2007, and was bottled up in the Gulf of Oman for several days instead of moving inland. EVEN AT CATEGORY-5 strength, Tropical Cyclone Gonu at over 155 mph, was not strong enough to break through the hot bare-soil barrier of the Arabian peninsula in June 2007 (NASA, Earth Observatory). 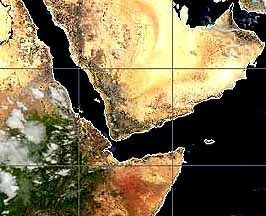 If large areas of the Arabian peninsula could be revegetated with the local native grasses and the savannah shade-trees, that area is in a pivotal location between Africa and India, and cooler soil temperatures in the summer might be enough to provide the “stepping stone” necessary for the summer monsoon moisture to continue falling in a westward path. The Arabia Peninsula Ecological Restoration Preserve? What if most of the land on the Arabian peninsula below the Tropic of Cancer, grazing was eliminated for ten years as an experiment, and the land was rested, to allow the land to revegetate naturally? And furthermore, what if a significant investment was made to speed up the natural restoration process, by harvesting and planting local native perennial grass seeds? The Arabian peninsula current receives only four inches (10 cm) or rainfall per year, but relic plant species in the area’s flora, indicate that raising the annual rainfall to at least ten inches (25 cm) could be a reasonable goal, and perhaps as much as a total of 25 inches (50 cm) could be achieved. This increased summer moisture could start rivers flowing again that haven’t flowed for 2,000-6,000 years, and would help lower the annual summer maximum daytime and night time temperatures for the country by as much as 10-20 degrees F.
that could start flowing again. River #1 was 650 miles long, and averaged 5 miles wide and 50 feet deep along its entire length, was studied by Boston University scientist Farouk El-Baz in 1993. (DISCOVER, July 1993 “A river in the desert”). Abi Hurairah (May Allah be pleased with him) narrated that the Prophet (PBUH) said, “ The Last Hour will not take place unless wealth becomes abundant and overflows; unless a Muslim gives the Zakat of his wealth, which no body accepts it and it comes back to him; and unless the Arab land turns once again into orchards and rivers” [“Al-Zakat*” Sahih Musslem. 157). In the Prophet’s “and unless the Arab land turns once again into orchards and rivers,” there are two scientific facts related to the Arab land. The first one is that the Arab land was an extremely fertile and greenery region, a fact which is affirmed by the Holy Quran. This is intermingled with the story of Prophet Hood’s (Allah’s Peace and Prayers be upon him) preaching his people A’ad who lived in the southern part of the Arab land. Allah Almighty states this clearly in: “Now fear Allah and obey me. Yea, fear Him Who Has bestowed on you Freely all that ye know. Freely has He bestowed On you cattle and sons,  And Gardens and Springs  Truly I fear for you The Chastisement of a Great Day .” (26:131-135). Further more, recent scientific researches and studies have approved this fact. In an article entitled “Traces In the Kingdom of Saudi Arabia Disclose a 10 thousand year Vagueness,” the author states, “There are many evidences confirming that in the past the deserts of the Arabian Peninsula had a more suitable and convenient environment for living than any subsequent time. Around ten thousand years ago, the Ruba’e Al-Khali Desert, being now regarded as one of the most drought deserts in the world, was a habitat for wildlife. Many species of wild animals like lions, reindeers, seahorse, and the like were of large numbers as those in Africa nowadays. (Ahalen Wa Sahlen Magazine: January Edition, 1988). The other fact in the Hadeeth is that the Arab land will turn into a fertile land as it had been ten thousand years ago. Beyond the shadow of doubt, it has begun to restore its fertile and greenery nature; big fertile and green farms have spread out extending long tunnels carrying water like streams. Numerous dams have been built as well. In addition, sometime ago, I had the opportunity to take a tour in Saudi Arabia; while moving along the road on the sides of Ruba’e Al-Khali connecting Najran to Riyadh, I saw very wide and vast farms spread out on the sides of the road. Also in the heart of the Kingdom is Al-Qasseem Province, which is now regarded as one of agriculturally richest regions. What is happening in Arabia is strongly bound to the Prophet’s words “the Arab land turns once again into orchards and rivers” as if he (PBUH) had seen all of that by his own eyes.